The taproom features a wide array of delicious brews, ranging from the lightest of summer ales to pitch-dark stouts. Many are brewed right on-site, such as the Daytona Beachin’ Summer Ale, an American-style pale ale that tastes best after (or during) a long, hot day in the sunshine. Or, get a taste of the Trioval Tripel, a classic Belgian-style ale with a golden straw color and a crisp, fruity flavor. Another favorite for those seeking a more full-bodied brew is the Silver Beach Stout, which features a roasted flavor with hints of molasses, chocolate and caramel. Of course, for those who prefer more traditional American beer styles, the brewery has a variety of options like the Daytona Blonde and the Road Course Red Ale. Better yet, purchase a flight to sample multiple styles and stay awhile! The selection is constantly changing, so you’ll never get bored — no matter how many times you make the return trip! Many visitors love that the owners and staff are well-versed in the brewing process and helpful in making selections. You’ll walk away from the brewery feeling like you learned something — then you can go back home and tell your friends you experienced educational beer drinking! And if your beer tasting works up an appetite, pay a visit to the food truck that’s usually on site — sometimes tacos, sometimes sandwiches, sometimes Southern BBQ, but always delicious. Occasionally, the brewery even partners with a local authentic pizza food truck and hosts a “pizza and pint” night. If you’re in town often or lucky enough to live here, the brewery also offers membership packages with a range of perks. Plus, the company’s gift-card offering allows you to send featured brewery gifts to lucky recipients, while the e-gift card lets recipients come and choose gifts for themselves. The best part of that is that no money is wasted — if the recipient doesn’t redeem his or her e-gift, the money is returned to your account. Come sip, sample and savor the flavors of the beach at Daytona Beach Brewing Company, located at 482 Fentress Boulevard, Unit N in Daytona Beach. And if you can’t make it out, you can always look for these brews in many area stores. Better yet, make Daytona Beach Brewing Company one of many stops on an excursion along the Daytona Beach Ale Trail. 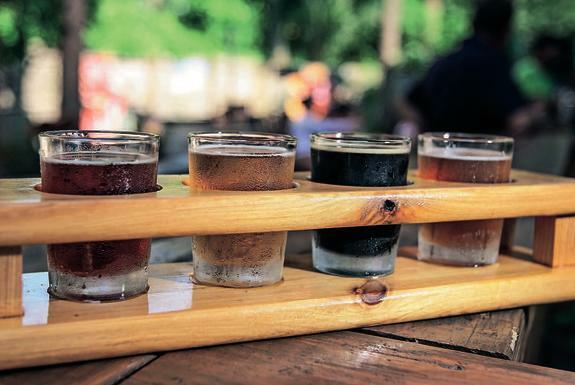 Grab your designated driver, expand your palate, and tempt your taste buds with an array of beers that represent the area — start planning your trip today!